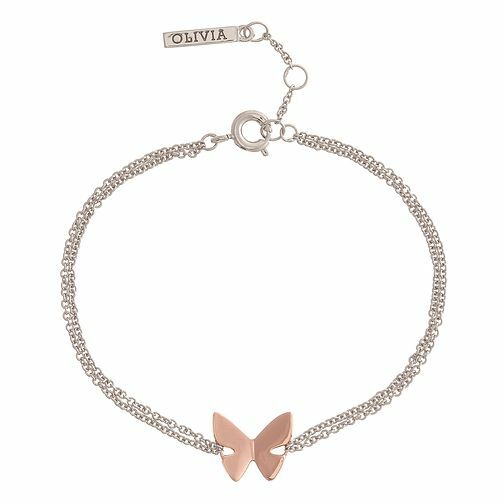 A Rose gold and Rhodium plated' fashionable bracelet by Olivia Burton, featuring a pretty butterfly outline for elegant and understated styling. Olivia Burton Rose Gold Plated Butterfly Bracelet is rated 5.0 out of 5 by 1. Rated 5 out of 5 by Anonymous from Love these bracelets Purchased these bracelets for my bridesmaids and Mum and they are lovely! Exactly what I was looking for. The turn out on delivery was quick too. Would definitely be ordering again soon.